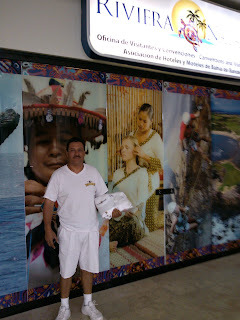 In an effort of all sectors of society to improve the image of Riviera Nayarit, and following the direction of the Governor for the People Roberto Sandoval, since February 1 a total of 496 authorized beach vendors in Bahía de Banderas have been wearing uniforms provided by the Convention and Visitors Bureau (CVB) of Riviera Nayarit, which strives to offer an exceptional travel experience for all the tourists in our destination. “This is a joint effort of all society, starting with the State Government, which is providing us with direction. Sellers are aware that if you project a better image of cleanliness, order, kindness and respect towards tourists, it'll make them feel safer and more eager to recommend us and to come back. Therefore, we’ve provided them with three shirts and two hats so they can achieve this goal, and when they do, we’ll all win because this will attract more tourists and will therefore improve the economy for everyone”, said Marc Murphy, Managing Director of the CVB of Riviera Nayarit. Uniforms were provided to authorized vendors by the Ministry of Environment and Natural Resources (SEMARNAT) on the beaches of Nuevo Vallarta, Flamingos, Bucerias, La Cruz de Huanacaxtle and the Palladium Vallarta. “Improving conditions for tourists is a constant concern of the Riviera Nayarit CVB, and we are convinced that word of mouth and direct recommendations contribute to promote our destination. Having a good image that conveys security to our visitors is an invaluable asset to our efforts in brand positioning”, concluded Murphy.